What are the experts saying about a strike on Iran? 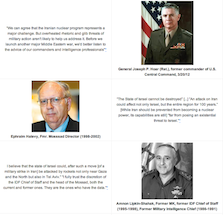 A significant and quickly growing number of Israeli and American security, defense and intelligence experts agree -- a military strike on Iran will not prevent Iran from acquiring nuclear weapons and would likely lead to a serious regional escalation of violence. Check out these and other voices speaking out on Iran. Do American Jews support war with Iran? Who supports an Israeli military strike on Iran? 2. This is not the first time the United States and the international community have taken an aggressive diplomatic approach. Indeed, there is ample historical precedent of countries-- including erstwhile "rogue states" like Libya, South Africa and Algeria-- voluntarily giving up nuclear weapons programs in response to a combination of international pressure and diplomacy.